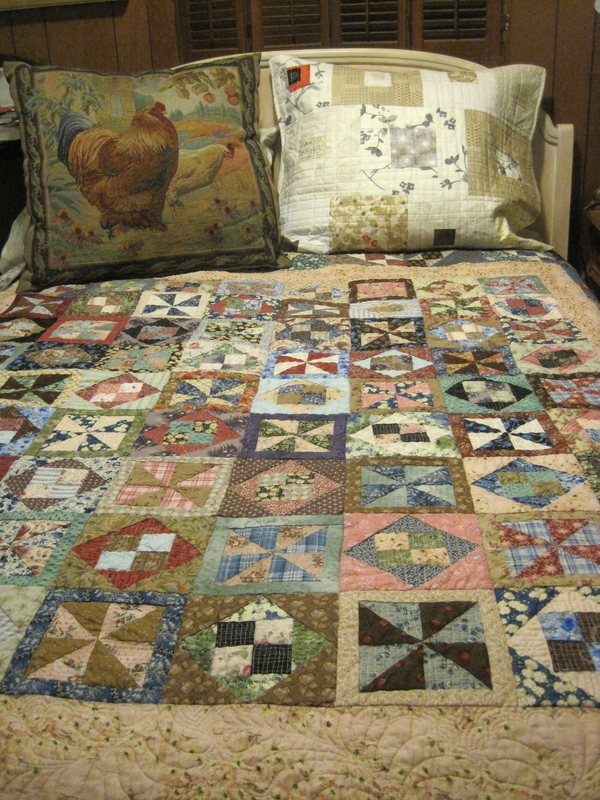 I usually rotate the quilts I use on my bed, but since putting this one on early in the spring, I haven’t wanted to change it out. I love so much about it. And I’ve been musing over the traditional/planned/accurately cut nature of it compared to how I’ve chosen to work in the past few years. You can see that although its scrappy, it did have a basic color plan–blue and pink with some brown, green, and purple thrown in. Its mostly 1800s reproduction fabrics, which I still love, but I also threw in some of my favorite more modern prints which were in the same color ways. 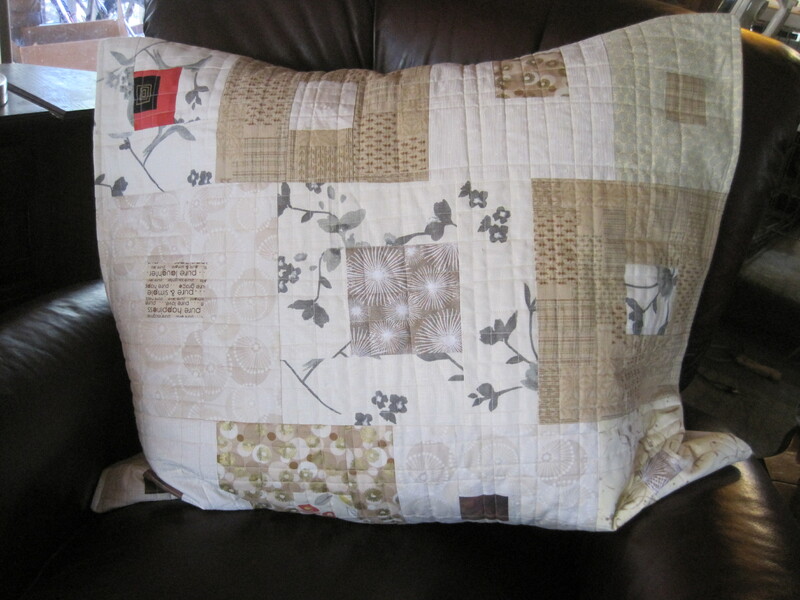 I saw the pattern in a magazine, but then I realized that the pattern was much smaller than I had thought. So I figured out how to turn a 4″ finished square into a 6 inch finished square. 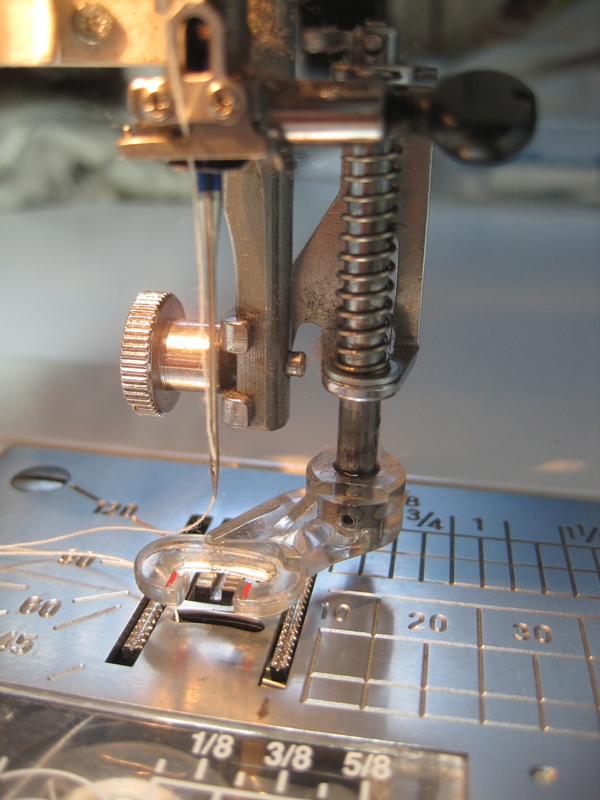 That made for some funny measurements, but I made little “kits” of pre-cut pieces, and that made it a little easier. 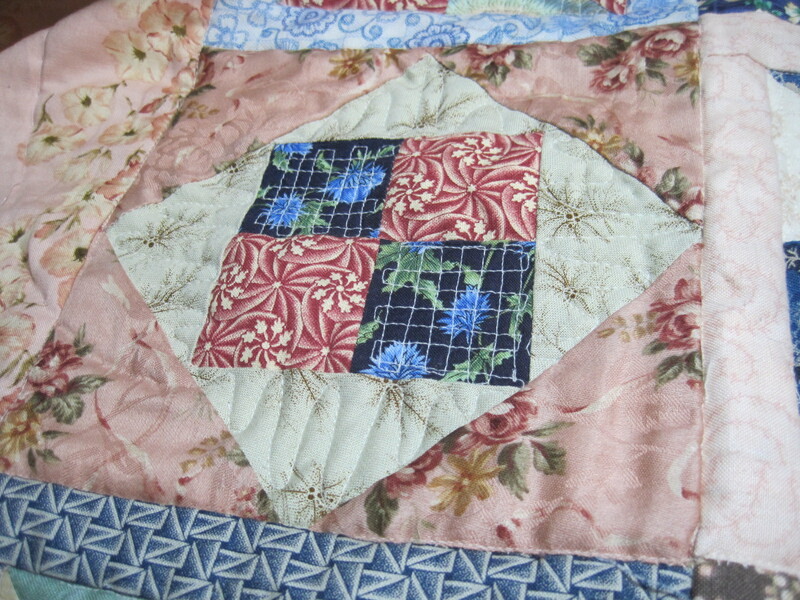 And I especially love that pink border that I was able to include. I still remember where I first saw that fabric–at Greenbaum’s in Salem, Oregon. It was on a tiny pincushion sample and they didn’t have any more of the fabric. 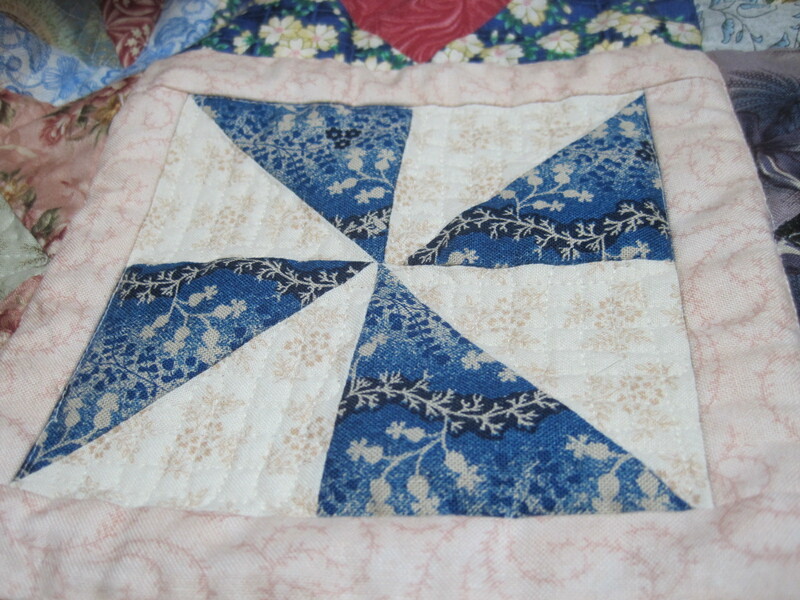 Probably more than a year later I found a bit of it somewhere, and have used it in several of my quilts. Its just so perfect, don’t you agree? In fact, I realized after the fact, that the color of my bedroom walls, which I worked with the paint lady to custom mix, was this same perfect color of coral-pink. 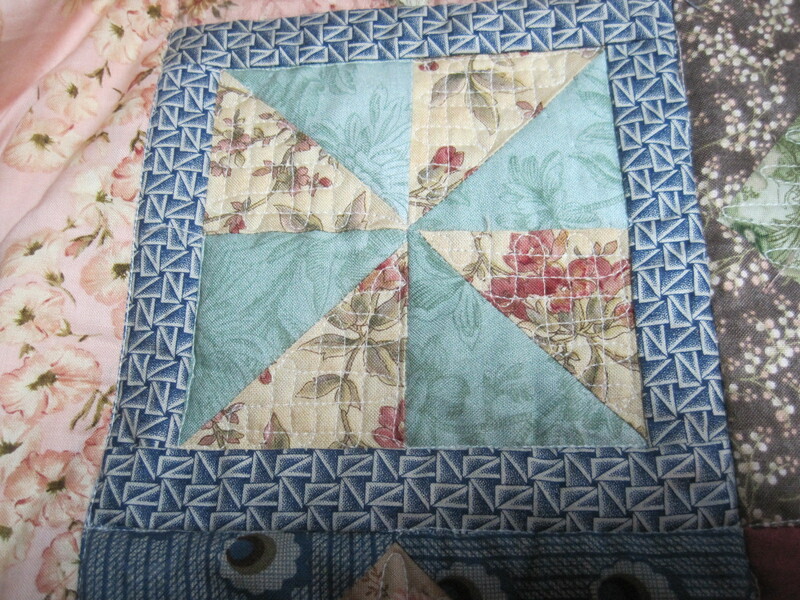 I also love the little patterns that I used to quilt it, and that I kept at it, even though it got so tedious and boring. 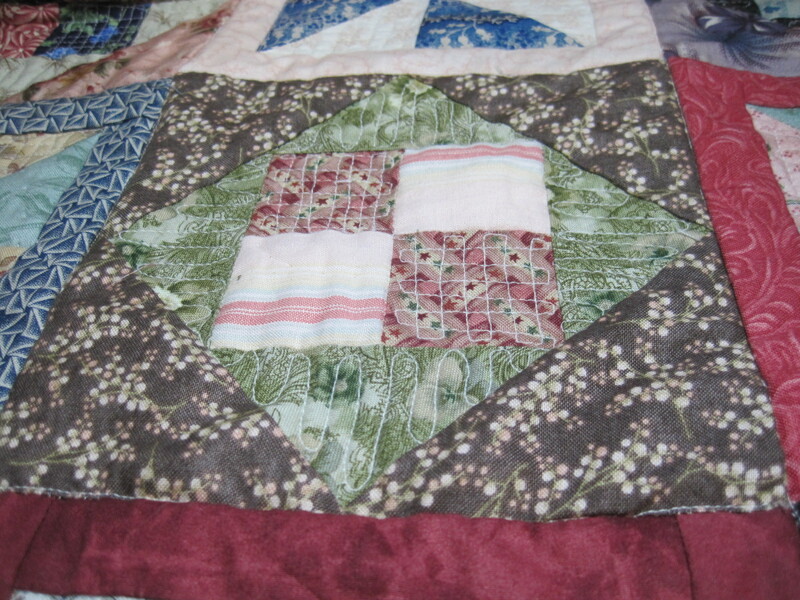 I like that I continued on and made the border as the original pattern showed, even though I was so very done with this quilt by the time I got all the little squares for the middle done. 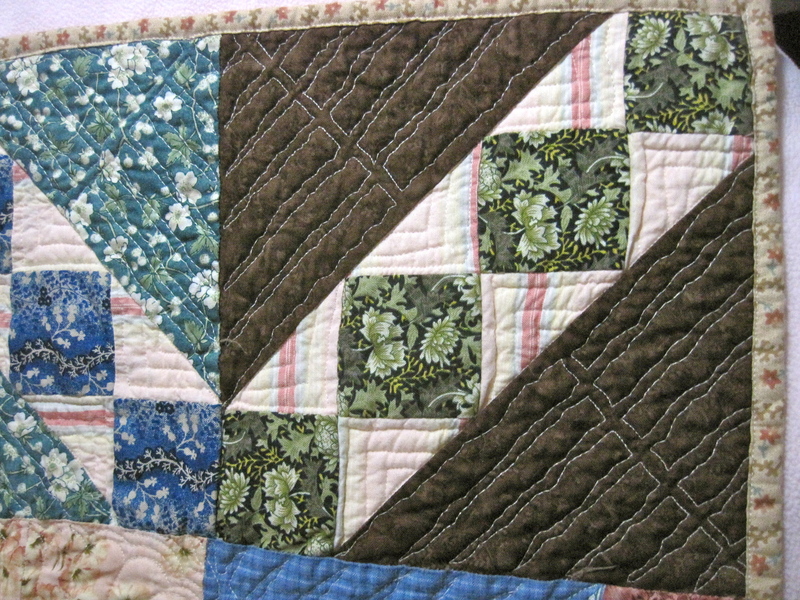 I like this pattern that I figured out for the border triangles. 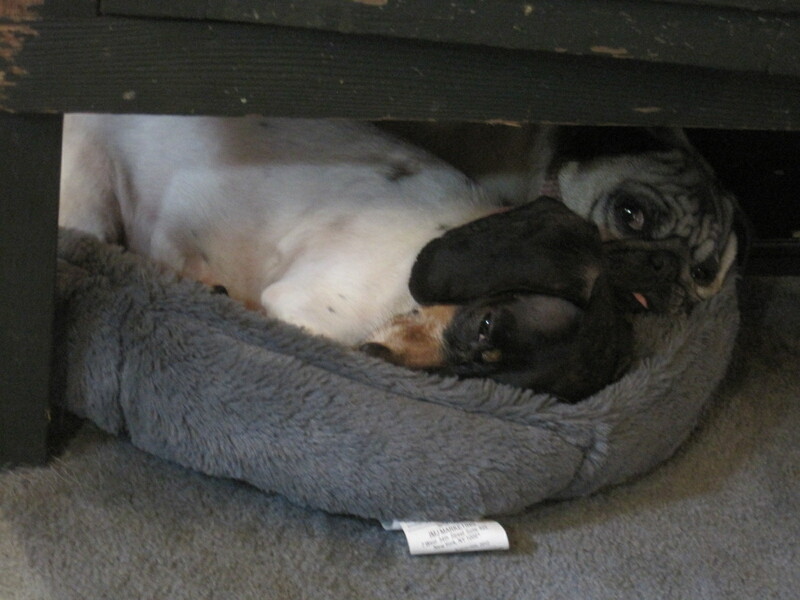 Since I sleep alone in a double bed (well, with two little doggies who hog two-thirds of the bed) I like to use a quilt that just hangs over the edge about six inches. This quilt is just the perfect size for me. 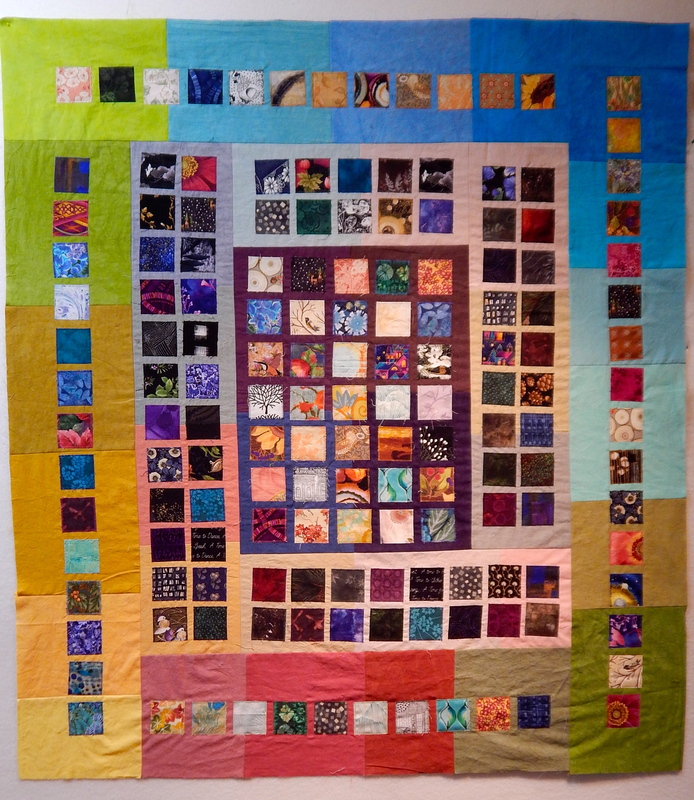 I think about whether I will make another quilt like this. I think what helps me is pre-cutting the pieces into those little kits. I put each particular size into little zip lock baggies. 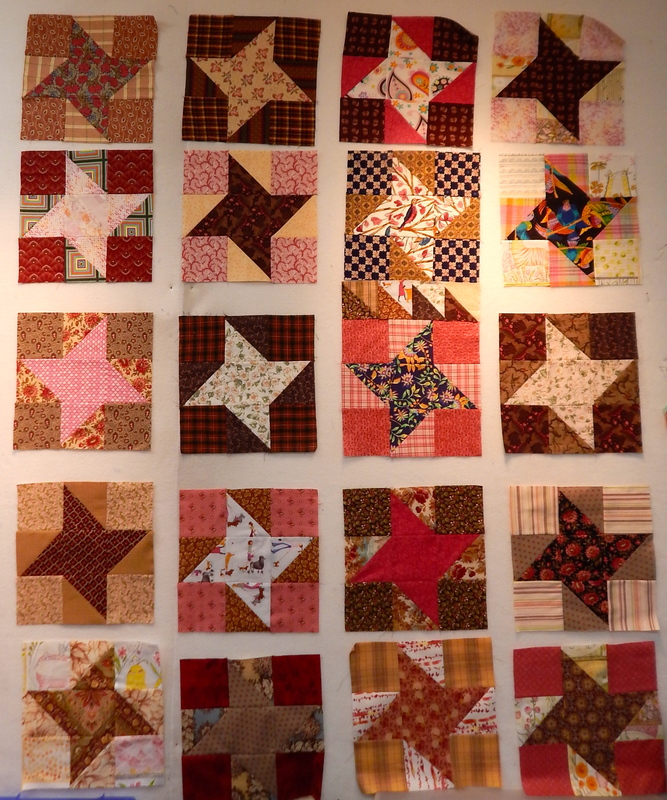 And then I chose the pieces in the color combos that I wanted for each block as I went along. 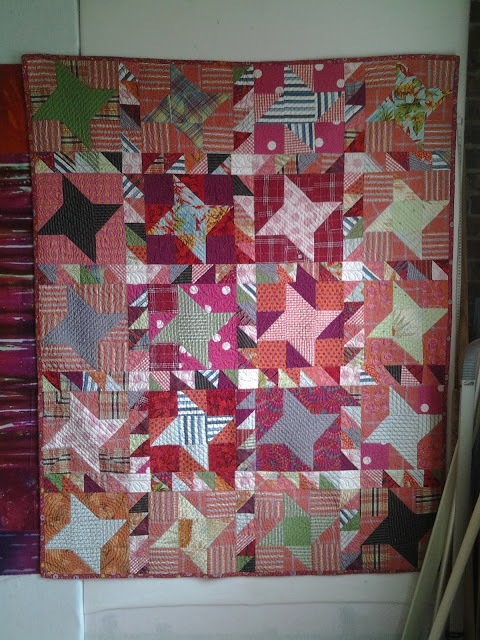 I’ve found that I don’t like strip piecing. It actually depresses me. So even though it might be slower, I find it infinitely more satisfying to finish one little block at a time.